New Mothers Get A New Kind Of Care In Rural Nigeria : Goats and Soda Local clinics may have "no staff and no stuff." Big hospitals are hard to reach. But when community health workers come to live in a village, there's a change for the better. How can women in rural Nigeria get the care they need? That's what Columbia University graduate students in public health asked residents of Kadawawa, Nigeria. How do you help a country struggling to provide quality health care, particularly to its rural citizens? More doctors would be great. New and better clinics would help. But in some places, community health workers are an important part of the solution. Community health workers live where they work. They're not trained medical professionals, but they do have "training that is recognized by the health services and national certification authority," according to the World Health Organization. And they've become a boon in Nigeria, which has one of the world's highest rates of maternal death — 576 per 100,000 live births in 2013. That's about half a percent of all births, though the rate is as high as 1 percent in northern Nigeria. It's easy to understand why care for new mothers is so poor in Nigeria. In the arid state of Jigawa in northern Nigeria, for example, farming hamlets are spread out, connected only by rugged terrain and rutted roads that are barely passable in the rainy season. Even on good days, it takes an hour and a half in a car to get to the nearest general hospital. But nobody has cars. Few have motorbikes. Those aren't the only obstacles. Local clinics are often abandoned dispensaries with "no staff and no stuff," says Sally Findley, a demographer and professor of population and family health at the Mailman School of Public Health at Columbia University in New York. And because Jigawa is a sharia state, women refuse to see male doctors. And even if women did make it to a big hospital, they weren't always happy with the results. They complain that the staff called patients from their community "villagers" and ignored them. Now, a new project is making great strides toward improving health care in rural Nigeria. By training and dispatching female health workers to live in communities, educate women about maternal health and help deliver babies, among other tasks, Findley and colleagues found a huge increase in the number of women who sought out prenatal and postnatal care. "One thing we found is that once you have community health workers in the community, it's like a tipping point," Findley says. "It really is a critical part of changing what people think." 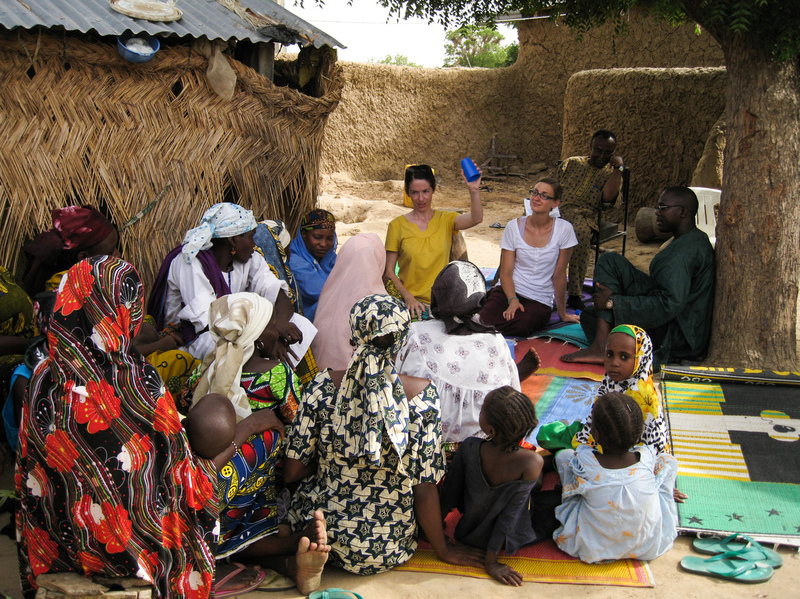 Previous work has shown that community health workers can drastically improve maternal health — including a 2014 study in rural Nigeria by Findley and colleagues, which found that this kind of outreach led to an increase from 11 percent to 24 percent of women who delivered their babies with a skilled birth attendant present and an increase from 25 percent to nearly 50 percent of women who received prenatal care. The pilot program started in 2011 by hiring four women who had completed a two-year program to become community health workers. They received extra training in how to deliver babies, among other practical skills. Then they took turns staying in the clinic and visiting communities in the area, where they talked to women about basic health issues, like how to recognize the signs of a risky pregnancy or how to know if labor is not going well. As word spread, women became much more likely to seek out health care. After seven months, the researchers reported in the journal Global Health: Science and Practice, there was a 500 percent increase in visits to the local clinic — from 1.5 monthly visits for every 100 people in the population to about eight monthly visits. The number of deliveries in a facility doubled compared with the year before. And monthly prenatal visits were as high as 21 percent of pregnant women, up from a maximum of about 6 percent before the project started. Over the following two years, evidence suggests that these improvements continued to hold. Before the program started, surveys showed that women in Jigawa were dissatisfied with their access to health care. "We have to give birth on cement floors because there is only one bed," said one woman about the community health facility. Another said male health care workers were afraid to touch female patients. So women delivered at home with traditional healers. Now women having babies are taken immediately to a staffed facility via a newly enhanced system of taxi drivers who are trained to help women in labor. And they are seeking a new kind of help when problems arise. "When pregnant women fit [suffer from eclampsia], we tie talisman around their feet or neck," said one community resident in a focus group of women held by researchers about the program. "But this practice has all changed. We have understood that it is a medical problem, so we take them to the hospital." Along with other studies of related programs, Findley says, the initial success of the project suggests that employing female health workers to engage with rural communities can make a huge difference in improving health and saving lives, and not just in Nigeria. "I don't think there's a country that can't benefit from community health workers," Findley says. Even in the United States, providers dispatched to rural areas can help people learn to manage diabetes, asthma and prenatal care, saving everyone both money and trauma. "In the long run, they're part of the solution."